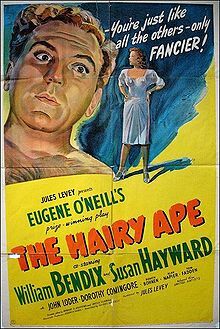 If you enjoy drunken ranting, some violence, and drama then The Hairy Ape, by Eugene O’Neill, is the perfect play for you. The story is about a New York fireman, Yank, who drinks, tries to act like he is the best, and is always trying to “tink”. Yank, and the rest of his firemen crew, are all drunks and they always argue and threaten one another, but usually people refer to them as Neanderthals or apes. The whole crew is against upper class society and always complain about it, then trying to claim they don’t want to be a part of it. They spit on the idea that they would live their lives like the rich and sophisticated. The story really gets started when the daughter of the crew’s boss comes down to watch them work. Yank wildly looks at her, while trying to build morale for his team, and she makes a disgusted face and refers to him as a “filthy beast”. This sends Yank into a fit of rage and he vows to take revenge on her and the upper class. He runs into a series of unfortunate mishaps like being imprisoned and not fitting in. The play really focuses on what lower class means. The story outlines the disrespect upper class people show to the lesser of citizens. Yank learns the hard way what the world saw him as. He found out that he was just a particular individual that didn’t really belong anywhere. Everyone has a reason for being in a bar drinking their lives away, but some reasons are more interesting than others. The play The Iceman Cometh by Eugene O’Neill helps show us that sometimes there maybe more to people in the bars we just assume are alcoholics, and that sometimes a long waited arrival of somebody can have adverse effects. This play takes place in the summer of 1912 in New York, inside a bar and roomer called Harry Hope’s saloon, with several drunks that all have interesting pasts, and reasons why they’re there. Most of the story is dialogue between several people in the bar who are awaiting the arrival of a great friend named Hickman. Hickman is often called by his nickname “hickey”, and is seen as a great companion, who always brings great fun and cheer to the bar. From the description the characters give, you can tell that Hickey is a fun- loving, nice, likable fellow that visits the bar for a drink every now and then. The Iceman Cometh is a very readable play, easy to understand the language, easy follow what’s happening, and not too complicated. Much of this story has religious aspects and comparisons that are at first hard to catch, but with the arrival of the “iceman”, or vessel, the comparisons become much more clear. This play easily captures the attention of the reader, or viewer, and easily became a favorite play of mine. It has been a joy to read, and I would definitely recommend it to anybody who enjoys great work; Eugene O’Neill was really at his prime. up being anything but what is was planned to be. This play shows us a family in destruction as the mother Amanda, tries to keep her family between her illusions and reality, while the older son Tom tries to find a sense of freedom and adventure. The daughter Laura, although not the most exuberant girl, has her own charm and delightfulness while trying to find her place in the world. The author tries to show a family filled with loss yet also with love. As Tom narrates us through the play, it slowly drags on leaving readers waiting for the end. Although Tom, uses not only stage direction but also music and illusion to give the reader a vivid image of what is going on, the reader tends to skip over those parts in order to find the real climax of the story. While reading the play it is as if the story never really starts and it is just as though someone is just writing down what went on throughout their day. When something finally does happen, it ends to quickly and had such a lack of impact that it leaves the reader wondering if there was any point to the play at all. The idea of a quaint little family with traditional views does not appeal to today’s youth and many will find it difficult to enjoy such a play. The Glass Menagerie is not worth the read unless you want a quick read to get through the day. Death and depression have always been main factors in Arthur Miller’s books. Death of a Salesman is no exception. The play starts with Willy Loman facing his problematic life, constantly confusing the past with the present while looking for the exact moment when his life went awry. Despite the bad memories of his dismal life, he believed that being well liked would make him a success. He instills this philosophy in his sons, Biff and Happy, but they grow up to have miserable lives. Willy desperately tries to win Biff over, but his advice only makes things worse. When Biff realizes his dad’s horrible teachings, he decides to tell his father off. Willy doesn’t take it well, and Biff leaves for good. It hurts Willy to know Biff is gone but it hurts Biff even more knowing Willy will never confront reality. money to Biff so he can start his own company. His plan goes amiss however, adding a twist to the death of poor Willy Loman. Miller’s play is well written and interesting. While it’s hard to get involved during the first act its progression into an interesting but depressing story keeps you going. The script style writing is confusing when there are flashbacks, but soon becomes clear. The play is a page turner that leaves readers stunned with an ending they will never forget. Our Town is set in Grover Corners, New Hampshire. Grover Corners is a small, rural and isolated Town. We learn about various characters who involve as the story progresses. Characters: Dr. Frank Gibbs, Mrs. Julia Hersey Gibbs, George Gibbs, Rebecca Gibbs, Mr. Charles Webb, Mrs. Myrtle Webb, Emily Webb Gibbs, Wallace “Wally” Webb, Simon Simson, Mrs. Louella Soames, Howie Newsome, Joe Crowell, Jr., Si Crowell, Samuel “Sam” Craig, Joe Stoddard, Constable Bill Warren, Professor Willard, and the narrator. Our Town is basically about a love between Emily Webb and George Gibbs, its about their life and all the hardships they must handle. Emily is also faced with problems within her own family, especially her mom. Mrs. Julia Heresy Gibbs loves gossip and normally gossips with rest of the woman in the story. This gossip is also spread by other woman, which make many things hard in Grover Corners as well as bad. The book plays out of life problems and how people deal with them, and how they deal with death. A high of the book is when Emily dies however cannot expect it and returns as a spirt. The play, plays on with many spirts and becomes interesting hence the spirts. The play is a drama, and the drama becomes very interesting as the story progresses. Our Town is very enjoyable play/book because Thornton really evolves and involves the characters and gets us interested. It’s a worth reading book and will tell you about life. Thornton tells us about life through a small town which relevant to a middle of no where town and shows us the cruelty of life, however, how life is still very precious. business world of “eat or be eaten” slogan. Biff Loman is the character who learns from his father and changes for the better. He realizes that only when he changes the establishments his father has instilled in him may he ever be happy. Death of a Salesman can be considered a tragedy, as the sense that Willy Loman plays the role of a tragic hero. Through his own inner flaw Willy meets his demise. Although fighting for his dream, Willy commits suicide. Death of a Salesman truly is a classic play that is perfectly fit for the America’s past times and even today. 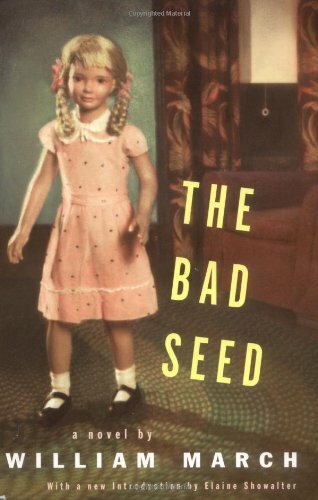 The play The Bad Seed by Maxwell Anderson is a very intriguing play that I have ever read. First off, we have an eight year old innocent looking blond girl named Rhonda who is friendly and nice, but has a extremely nasty side. What is it? Its that she kills whoever she wants just to get what she wants. Apparently, her first unexpected victim was Claude Daigle who apparently won the penmanship medal in a competition between him and Rhonda. I think it was surprising that she actually kill for revenge. Then there was Rhonda’s mother, Christine. She was worried about the unexpected death of Claude and eventually recovered her lost memory of her childhood before she was adopted. She realized that she was the daughter of a well-known serial killer. Also, this new twist made it even scarier when she discovered her grandmother was one too and was executed after killing twenty people without a second thought. This play is very interesting because there is still more to it, but scary indeed. I’m amazed that a little girl would even think of killing someone just to have something her way. I think this book is really popular because there is another movie made on it that is coming out soon as well.